Here’s your fact for the day: The Sitka Ranger District is 1.7-million acres. That’s about the size of most of the nation’s other 154 National Forests. Perry Edwards has been district ranger in Sitka since June of 2014. He told the Chamber of Commerce this week (11-23-16) that — despite two timber operators in the district — fisheries remain the top economic driver in the forest, with 25-percent of the entire West Coast’s entire salmon harvest coming from the Tongass. 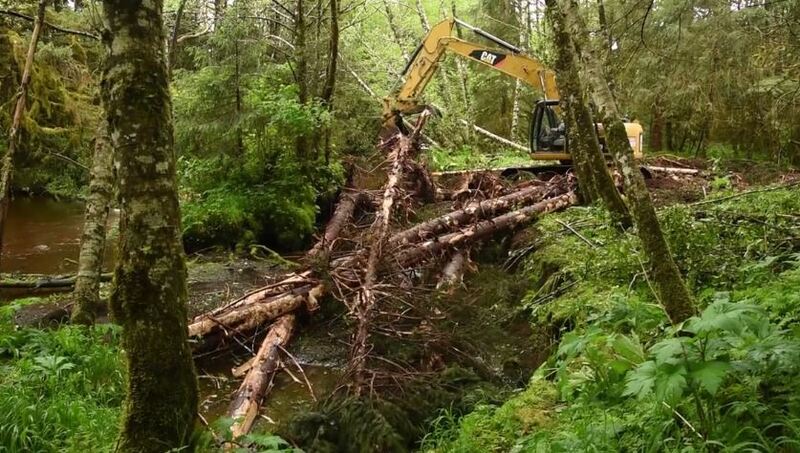 The Sitka Ranger District recently has specialized in salmon habitat restoration. Edwards said it makes economic sense. Unlike the lower 48 where they can spend $1 million on a fisheries rehabilitation project and get 10 salmon to come back, the return on investment here is incredible. We can do projects that will bring back 100,000 or more pink salmon every year, from now into forever. And that is so important to me that we can be able to do that. And so when they say, Well you’re fish aren’t endangered, maybe we shouldn’t give you the money, maybe we should give it to these places on the Columbia? My response to that is look at the return on investment. Look at the commercial and economic aspects to Southeast, to Alaska, and to the nation as a whole. And maybe you’re a little short-sighted in how you’re looking at those things. Don’t wait until the last one, to get there. Restoration in Shelikof from Sitka Conservation Society on Vimeo. In addition to fisheries, recreation has become important to the forest economy. This year the district issued 43 permits for outfitters and guides. In a highly-publicized incident this summer, one of those tours ran into an aggressive brown bear sow on the Sitkoh Lake trail, and one of the guides was seriously injured. Edwards said it was important to maintain a balance with visitor use. We’re trying to weigh many things. We want to have people come to this place and see how incredible it is. At the same time we don’t want them to be encroaching on the locals who are doing our thing to subsistence hunt and subsistence fish. It’s a delicate balance, and everyone’s got an opinion about how we should be doing it. And my role, and the Forest Service’s role is to find out what the greatest good is. Oftentimes there are no wrong answers; it’s trying to find the most right answer, which is no easy feat. The district’s new headquarters on Halibut Point Road accommodates 52 employees — down about 100 staff members from the logging heyday in the 1980s and 1990s. As demand for recreational access to the forest increases, Edwards said the district has had to cope with a loss of funding. We’re struggling with that. The budget from Congress is down 42-percent. That’s huge! A lot of times people don’t recognize what they’re missing until it’s gone. They say, Well 42-percent and you’re still doing everything that needs to be done, then obviously the rest of that was just fat and you didn’t need that money. But if it really weren’t for the hard work of people who just can’t say no, and won’t let things go, it wouldn’t be that way. But we’re having to make some hard decisions about things as we go along that way. We’ve been looking at other ways to deal with things. We’ve been looking at ways of reducing costs, and being sustainable in the things we do keep — which is critical in this day and age. Relief for some of the district’s funding pressure may come from Sen. Lisa Murkowski, who sits on the Senate Committee on Appropriations. Murkowski has inserted language into a recent appropriations bill to increase recreational spending in the nation’s forests. Edwards told the Sitka chamber that he’s prohibited from actively lobbying for the bill, but audience members were not. He admitted that the Sitka district could make a better case for itself. We have not done as good a job as I think we should have — and I’m working on it now — to try and articulate what does that mean? It’s easy to say timber jobs. There are this many timber jobs. That means this much money to the mill, that means this. When you start getting into: What is the value of scenery? What is the value of wilderness? What is the value of those outfitter/guide permits? It gets a little more difficult to figure that out. But those people come here, they spend money here, they come back here again. So I think it’s really critical to look at those other things. And somehow Congress needs to understand what they’re risking by reducing our funding so much. Perry Edwards is the Sitka District Ranger. During his remarks to the chamber, he celebrated the economic contributions and volunteerism of the 52 staff members of the district — including his own: Edwards is the current president of the board of the Raven Radio Foundation. PreviousThe Turkey Trot is back!